Eye tests "are vital for drivers"
Car insurance company Swinton has reminded contact lens wearers that they need to check their eyesight regularly to ensure they are safe when hitting the road. Research by the firm revealed that 34 per cent of drivers have not had an eye test in the last four years, which could mean that they do not meet the safety requirements set out by the Driver and Vehicle Licensing Agency. Some 26 per cent had not made a trip to their optician for the past four to six years and six per cent have avoided going for over a decade, the survey also discovered. 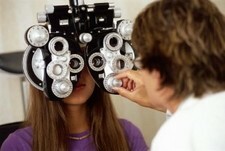 The company added that contact lens wearers can perform a simple test to determine if their lenses are strong enough. "A motorist should be able to read a number plate from a distance of 20 m for vehicles displaying the new type of registration plate, or 20.5 m for ... the old style," it said. Recently, a post on the Health Articles blog recommended contact lenses for people who require vision correction but are fed up of wearing glasses when driving.